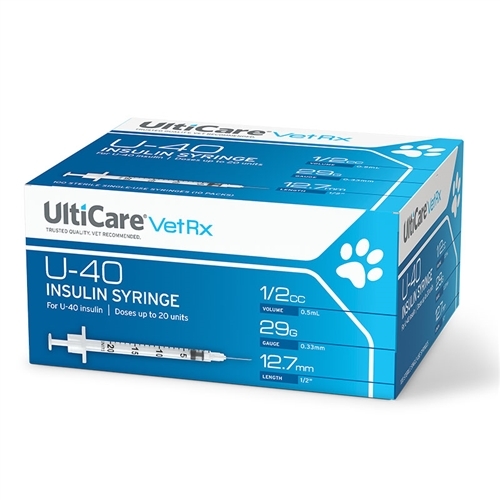 Ulti Med, Inc. has developed the UltiCare U-40, a syringe that is specifically designed for U-40 insulin prescribed by veterinarians for pets. Many veterinarians are now prescribing Protamine & Porcine Zinc Insulin (PZI & Vetsulin) known as U-40. Though not a diluted form of insulin, U-40 is weaker, thus allowing for larger, more easily measurable doses for small animals. Today, many people are treating their pets for diabetes using Protamine & Porcine Zinc Insulin (PZI & Vetsulin). Usually designated as "U-40 Insulin", U-40 differs from the standard U-100 Insulin that is prescribed for people with diabetes in the way that it is measured. The "U" refers to actual "units" of active insulin. "Units" are a standard measurement system for many drugs. 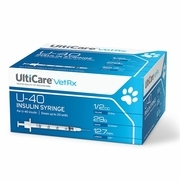 UltiCare U-40 syringes are designed to provide the proper dose of U-40 insulin. This means that measurements of one unit of the UltiCare U-40 syringe will give you precisely one unit of U-40 insulin. Using the UltiCare U-40 syringe means that you can fill the syringe in the normal manner and do not need to rely on any conversion tables. Your veterinarian has prescribed the proper dosage of U-40 Insulin for your pet. UltiCare has provided the proper syringe to deliver that dosage. I ordered Ulticare syringes for my diabetic cat. I have to say they are the same as the VetCare syringes. It is nice to know that I have options when it comes to syringes. Delivery was fast and the price is right. I will continue to order from this company and they have great customer service! The order was shipped and delivered very quickly. This is the second time I have ordered from this company and they give great customer service. Anyone looking to purchase syringes this is the go to company. The price is also right! Thank you! I was paying $39 dollars for 1 box of 100 U-40 syringes from my vet. I am able to purchase 200 syringes (2 boxes) for $48 from PetsTruly.com. That`s a great deal. Recieved quickly, and without the need of a prescription from the vet. Also, sent to an FPO address and that doesn`t always happen. I`m very happy with your product, service, and savings over what my Japanese vet charges for needles. I`ve given your information to the American vet on base to give to his patients. Very fast shipping, the product is exactly as advertised, no qualms about extra paperwork. Great service. Exactly what I`ve been getting from the Vet but sooo much more reasonable. I have a diabetic dog and this disease is very costly, so I am so appreciative of this web site. I received the syringes in a timely manner. Absolutely will continue to order from this site. I have two cats that are diabetic, and I have been purchasing boxes of U-40 insulin syringes from Petstruly for at least four years now. Having thoroughly done my `homework` in advance of any purchase of diabetic supplies, I can tell you that the Ulticare U-40 syringes are the best on the market. And, I really appreciate being able to use PayPal on Petstruly`s website to pay for my purchase! The entire experience of dealing with Petstruly is refreshingly positive, and I will continue to make them my only source for these quality insulin syringes. Thank you, Petstruly! Your service and prices were the best. I didn`t have any problem with the website, very easy to use. I received my order in great shape and very quick. The syringes are the best I have found on the market. Numbers are very easy to read. I am so glad I found this website. Your product makes it very easy to give my dog his insulin, little to no pain. Thank you for making a bad situation a little easier. The UltiCare 29 guage needles are so fine that they are a breeze to administer the dose with little to no pain for my 13 yr.old cat. I give him a few treats at the same time and it`s over before he knows it happened. It`s the best product I have found to give a shot of insulin! Prices are wonderful too! I began buying these syringes from another online company, but soon discovered these WITHOUT the large plastic container that dispenses them, an unnecessary waste of resources, and more money! So, by buying these, I am cutting my costs and saving (plastic/oil) resources, and I don`t have the bulk of disposing the large container. There are no children in our household to worry about the danger of spent needles. These work great for us!